The Home Office has today hosted a cross-agency roundtable as part of its efforts to tackle the demand on police of dealing with cases involving mental health issues. The police and health response to those in mental health crisis has improved, supported by government funding, legislative changes and better partnership working. But it remains the case that many calls to the police have a mental health component. Today’s roundtable brought relevant agencies together to share good practice and consider further opportunities for collaboration to ease the burden on the police and provide mental health sufferers with appropriate care and support. It was attended by Minister for Policing and the Fire Service, Nick Hurd, officials from the Department of Health and Social Care and representatives of the emergency services, among others. "Police are too often left to deal with people suffering from mental health issues, who actually need help from healthcare professionals and social services. "We have made progress but are determined to do more to free up police time so they can focus on fighting crime, while ensuring vulnerable people get the care they need." The roundtable follows the minister writing to all forces and police and crime commissioners in February asking for more information about the scale and nature of the demand they face. 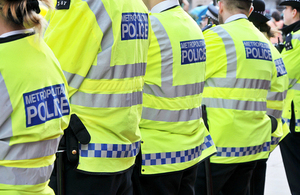 The feedback showed a sizeable proportion of the cases involving mental health issues that the police deal with relate to ‘concern for welfare calls’. They may involve injury, missing persons or suspicious circumstances, for example, and come from the public or health and social service agencies. Some individuals with complex needs are also persistent callers to emergency services. The Metropolitan Police said they logged 2,269 calls from one individual in 2017. Police have previously estimated that they may spend between 20 and 40 per cent of their time dealing with mental health cases. Examples of good practice shared by police forces included street triage schemes, which enable officers to access health professionals for timely and relevant advice, and initiatives to put care packages in place for persistent callers. The government has invested £30 million to increase health-based places of safety and banned the use of police cells for under 18s in mental health crisis. This has led to significant reductions in the use of police cells to hold people detained under section 136 of the Mental Health Act. A roll-out of mental health assessments in custody suites and criminal courts also continues, supported by government funding.